Sacramento, California - “Real food” is the rallying cry of Generation Z grocery shoppers, according to a recent report from The NPD Group. Gen Z, those born between 1997 and the present, represent 27 percent of the U.S. population. They have higher consumption rates of organic foods and beverages than any other group, NPD said, and were taught to value food based on nutrition and function, not just in terms of taste. Many assume Gen Z is a carbon copy of the millennial generation, and while they have similarities, the differences will “require grocers and food manufacturers to fine-tune their messages,” NPD said. Gen Zs are similar to millennials in their demand for authenticity, freshness and purity in their products, but more than millennials, Gen Z consumers say clean eating improves their quality of life and that fresh foods play a key role in their lifestyle. And they aren’t just saying that. Gen Z accounts for some of the heaviest use of organic and non-G.M.O. foods, according to NPD. Gen Z consumers also differ from millennials in their attitude toward large brands. While millennials tend to favor smaller, niche, local brands, Gen Zs choose brands based on different criteria. 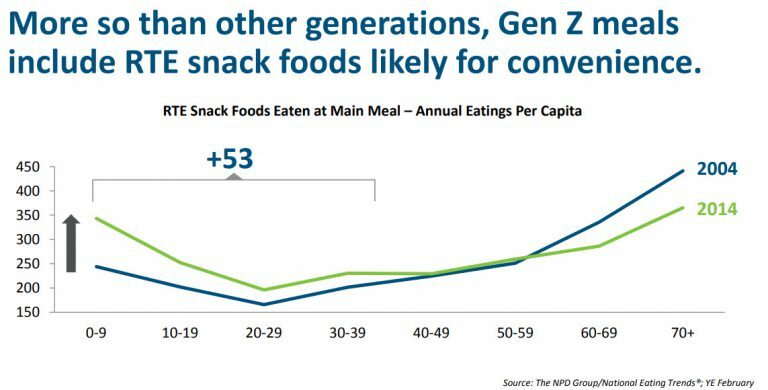 Gen Zs also approach snack foods differently. The generation’s on-the-go lifestyle lends itself to more read-to-eat foods that may be incorporated into or in between traditional meals. “Snacking is just can extension of who this generation is,” Mr. Portalatin said. “They’re more likely than any other generation to incorporate snack foods as a part of … breakfast, lunch or dinner. In fact, they’re doing this at a rate 53 times more on a per capita basis annually than any other generations.